Deli-Beads. 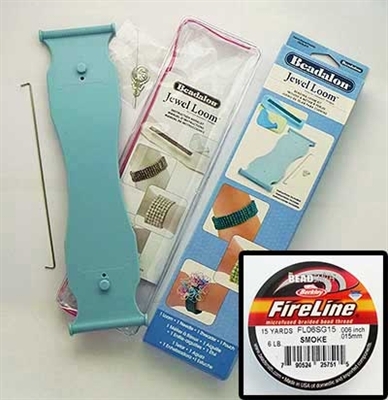 Beadalon Jewel Loom Kit + BONUS FireLine! Top / Tools / Looms / Books / Beadalon Jewel Loom Kit + BONUS FireLine! Beadalon Jewel Loom Kit + BONUS FireLine! The BEADALON Jewel Loom Kit by Julianna C. Avelar is the perfect accessory for Looming On-the-Go! This innovative little loom is portable, lightweight and extremely easy to use. It's work surface is 10 1/2" Long by 2 3/4" Wide and fits perfectly in the palm of your hand providing you a comfortable grip and ultimate control while bead weaving. Experience countless hours of enjoyment creating bracelets, necklaces, earrings, pendants, pouches, hair accessories and much more. - Full Instructional Pamphlet included with kit. - Beads are NOT included.